Jute Cottage sells stuff mostly made out of jute – from handbags and jewellery to home decor and accessories. If you’re planning to give your living room a makeover with earthy show pieces and decor, make a beeline to Jute Cottage in Mantri Mall. It makes even more sense if you're done with all the plastic, wood and glass decor that's on offer everywhere else. In fact, you can do up your entire living room with jute-based stuff. We love the wall clocks and jute mats for a hint of rustic. They also have vases, but those are obviously not jute! But delicately painted, and colourful, they make a nice addition to your side table. Have a balcony? Pick up a wind chime or two. The store doesn’t limit itself to just home decor; it’s got everything cute in jute for everyone. 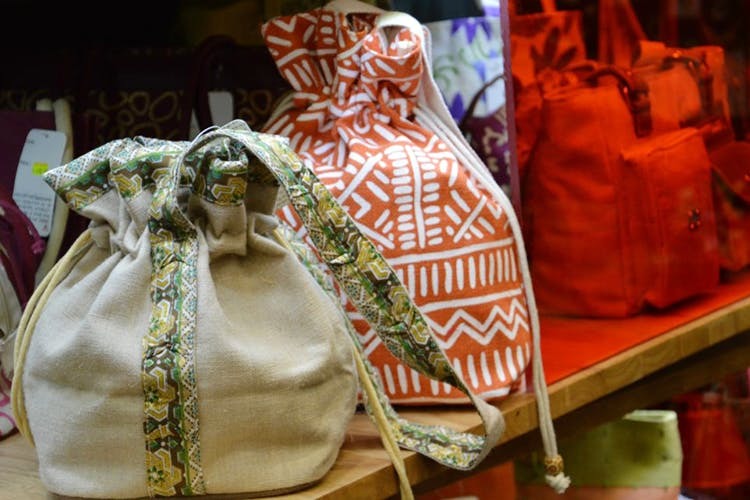 Natural jute handbags, handmade crafts such as hand fans, notebooks and even laptop covers. Ladies, you can go all out with the tribal and ethnic jewellery -- including earrings, rings, necklaces, that are chunky and can be paired with ethnic outfits, and dresses alike. Pottery and everything eco-friendly you can think of, is also on offer. Their fast selling jute bags are totally worth the hype and price; pick any one for prices between INR 250 – INR 999. The store is small, but you will be surprised to see how they are able to fit so many things. The store has got something for every nook and cranny of your house in the true sense, so take your time shopping. The products start at just INR 80, so you can really fill up the shopping basket. The store is too small which makes it browsing through the products a bit difficult.